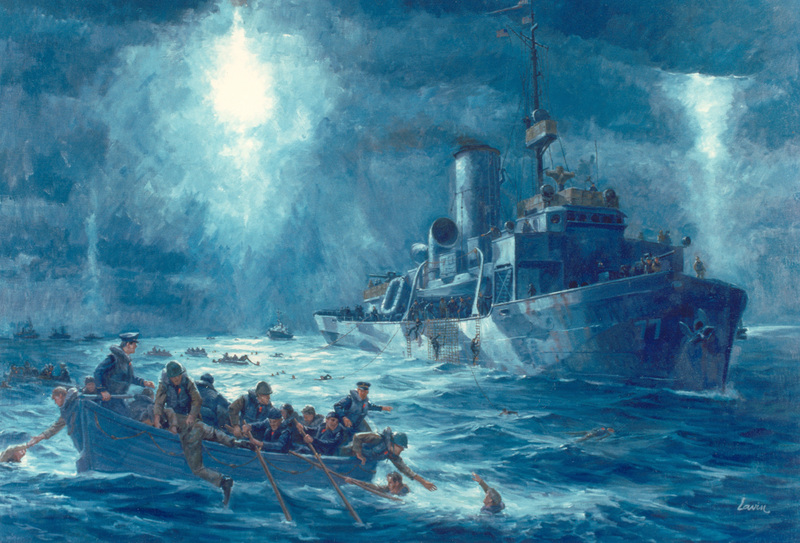 A depiction of the rescue of Dorchester survivors by the Coast Guard cutter Escanaba on February 3, 1943, in the North Atlantic. From 1942 to 1944, Harvard served as home for the U.S. Army’s Chaplain School, where a five-week program during the height of World War II graduated 20 consecutive classes of “sky pilots”—6,449 in all: priests, ministers, and rabbis representing the three faiths then recognized by the American military. Their training included long marches, defense against chemical warfare, military law, first aid, military sanitation, and graves registration. Men of different denominations were intentionally bunked together, to promote tolerance and understanding. The Reverend George L. Fox , Rabbi Alexander D. Goode , the Reverend Clark V. Poling , and Father John P. Washington  were classmates during one of the school’s first-year sessions in Cambridge. They were reunited in January 1943 in New York City, assigned to sail for Europe on the SS Dorchester, a troop ship carrying almost a thousand men. On February 3, not long after midnight, a torpedo struck; the ship’s electrical system was destroyed, frigid water poured in, and the vessel sank within 27 minutes. During that scant half hour, the four chaplains worked in the darkness to organize an orderly evacuation of those trapped below deck, to get men into lifeboats, and to distribute life jackets. When the supply ran out, they gave away their own. Survivors reported seeing the four of them, arms linked, braced against the ship’s railing, singing hymns and reciting prayers as the Dorchester went down. Rabbi Arnold E. Resnicoff, a retired captain in the U.S. Navy Chaplain Corps, delivered the keynote address. “Military service,” for many people, may not evoke ministry, but Resnicoff spoke of how chaplains help strengthen the interfaith values that in turn strengthen the services and those within them. In many ways, he added, chaplains also bridge the gap between the civilian and military worlds—a role of special importance today, in a country where so few citizens have direct ties to those in the armed forces. Because the chaplains’ actions did not occur during “combat with the enemy,” they were ineligible for the Medal of Honor, which many felt they deserved. 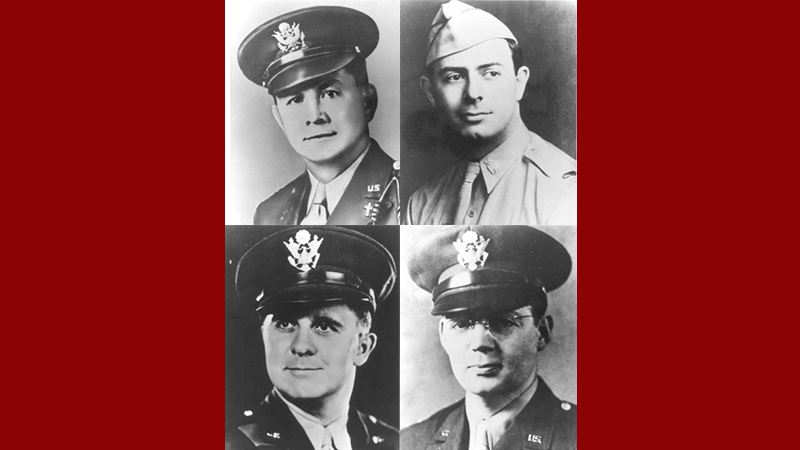 On July 14, 1960, an Act of Congress approved the Four Chaplains Medal , awarded for extraordinary heroism. Only four were struck; these were presented in 1961 to the chaplains’ next of kin. As one of three chaplains on duty  when 241 men died in the bombing of the U.S. Marine barracks in Beirut in 1983, the rabbi was himself later honored, with his Catholic and Protestant colleagues, by the Four Chaplains Memorial Foundation . His presence lent further solemnity to the dedication of a plaque, newly affixed to the north wall of the sanctuary, memorializing his four predecessors. The tablet joins others  installed there within the past decade under the auspices of the HVAO, including a tribute to the University’s Medal of Honor recipients . President Drew Faust, a veteran’s daughter, attended the service, and HVAO’s founder, Tom Reardon ’68, thanked her warmly for welcoming the Reserve Officers’ Training Corps back to campus  in 2011 and for her support of service members and veterans enrolled at the University. His remarks also announced a further step to continue links between Harvard and those who serve in the military: the College has joined a national mentoring effort that encourages and supports veterans seeking an undergraduate degree. The three-year, preliminary affiliation with Service to School’s VetLink  program is supported by Reardon and a fellow Vietnam veteran, Bruns Grayson ’74. “Harvard students and alumni who answer the call to serve in the military are an essential part of our University community,” Faust declared in a statement issued just before the Saturday service. The new plaque displayed in Memorial Church, honoring four men who passed through Harvard and, indirectly, the thousands of fellow chaplains who followed them, offers a valuable reminder of one aspect of that service. Read the Harvard Gazette coverage here .